4: Jupiter, the Bringer of Jollity ~ 5: Saturn, the Bringer of Old Age ~ 6: Uranus, the Magician ~ 7: Neptune, the Mystic. Decca ACL 26 (LXT 2871) 1960 pressing, c.1958 matrices: ARL2067 -1DR / ARL2068 -1DR. Recorded: 17/20-21 May 1954 - Kingsway Hall. Minimal de-click ('1.2') + very slight treble increase to help compensate for any loss of 'air'. I was just wondering about this recordings, having just heard the 1958 stereo remake recently! It's nice that Sargent's EMI material has finally gotten some attention (via that 18 cd collection), but there is still much that is neglected. So, thank you very much for this overlooked (never on cd, as far as I know?) version! What a shame that Sargent's projected Sibelius cycle was never completed! Have you got a nice copy of the Sibelius 2nd? I've never heard it, but the 1st and 5th (and broadcast of the 4th) are wonderful, IMHO. I wasn't sure about this, still, being 'Not on CD'. I've several iterations of the BBC HMV ASD's which are impressive (except for my dispensed-with very first matrices) but think this is slightly better-played. HMV probably 'gave-up' with his Sibelius Symphonies - the 1st is 'OK' except for the final mvt - the 5th seems 'inept' in terms of' 'symphonic argument' - although I gave-up soon after the start (only have the ALP mono ) never heard the 2nd...his Rachmaninov 3rd is pretty hopeless!! The interest in the early HMV's is the recording-technique - very nice spacious balance - Beecham's Scheherazade sounds wonderful in the earliest 1958 ASD matrices. Hi TE, Thanks for another trip down Memory Lane: the ACL was the first LP I ever bought and there was nasty jump in Uranus when played on my Dansette - I've since graduated to better equipment. I haven't played it much since, so am happy to renew its acqaintance. The BBC recording is much underrated- the woodwind playing on that is superbly "open-air" and English. I saw Sargent conduct Sibelius many times, and the cliche is true, he was far better in concert than in the studio. I can still recall his coda to the second symphony - it just grew and grew, and then stopped, without any ritardando. (not quite as persuasive in the LP, whch I posess). I take issue with you on one point about the Rachmaninov 3 - his is the only performance I've heard which seems to understand the rhythm of the final bars. You seem to have recovered your spirits - I hope that is true physically as well. Just don't try to overdo things. I don't know what setup Bryan Bishop is now likely using - as downloaded the Harty/Mendelssohn 4 and it sounded excellent - no artifacts/low shellac noise/considerable detail+brightness..so I definitely wouldn't bother dubbing any 78s! Its sort of a shame that Decca recorded this just too early for stereo. I sort of wonder where they actually built the first stereo setup, since they started recording in Paris and Rome in late July(?)) 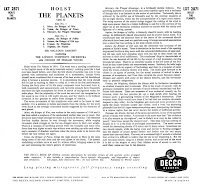 of 1954 (based on the Ansermet Paris stereo recordings and the opera recordings made that summer (Rigoletto is mono, but the Manon Lescaut, Otello, Barber of Seville are stereo), Then in Vienna with the Mozart operas. 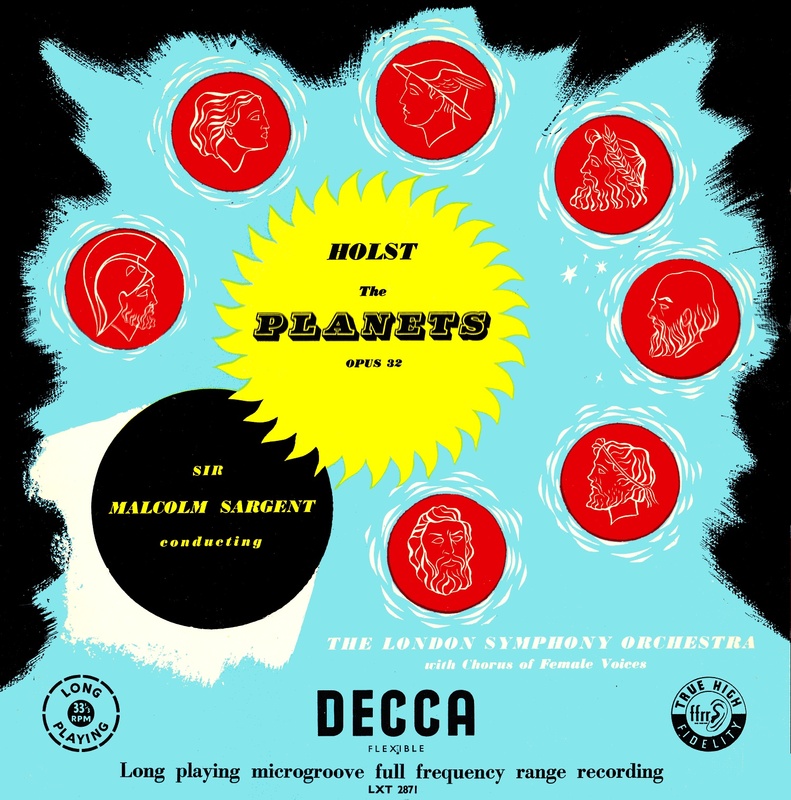 One would have thought that technical development was done in the UK and that they might have tried it out in London first, But the first Decca stereo recordings originating in London locations seems to be later (1956?). Actually does anyone know what was the first Decca stereo recording recorded in a London location? So long as this sounds OK..as obviously I don't like using de-click - but the listed CD (Mr Pristine) mp3 sample sounds pretty smothered by comparison..
Dredging my memory (spending mucho time trying to get sunburn) wasn't that first UK stereo the Winifred Atwell/LPO/Stanford Robinson Grieg Concerto?? (1-2 Dec 1954)?? only ever issued as mono: don't have it: but another luscious Mr Pristine affair.. It is sometime since the last comment on your blog for this performance but I hope your health is continuing to improve. I concur with all your previous contributors in urging you not to overdo your efforts to recover. As you have probably been advised, keeping your blood pressure down is essential with regular monitoring. Not all medicines are poison and sometimes it is a balance between the good they do and, maybe, long term harm. There are no simple answers. I take Amlodopine which has lowered my BP from above 190 to below 140 and Atovastatin . I don’t like it but the alternative scares the hell out of me. Anyway I send you my very best wishes for your future good health. Thank you very much for this excellent download. This is one of my earliest Lp acquisitions and have always thought it a very fine performance. I obtained the ASD stereo not long after but was greatly disappointed with the confused and rather opaque recording. The later CFP issue was much better in clarity but lacked bass. 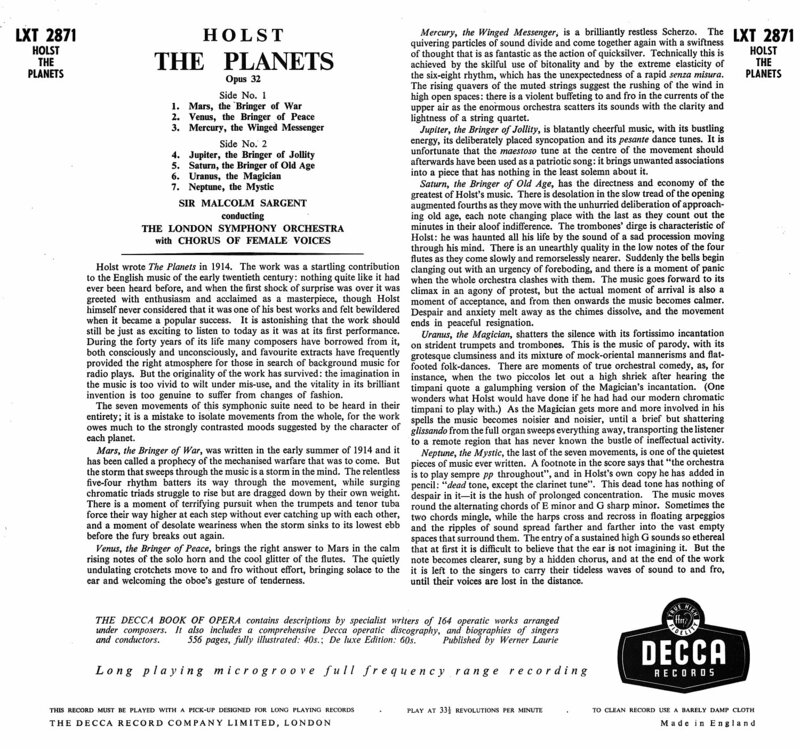 The companion ACL disc of Enigma was recorded slightly earlier and Decca seem to have improved their microphone technique for The Planets. It is a useful issue but the performance is a bit lacklustre I feel. I much prefer the ASD Philharmonia. (My first stereo acquisition). When played on good equipment the result can be stunning. The Purcell/Coates suite is not otherwise available and may be worth transferring and posting alone. The Sibelius issues with the BBC S O are rather good in their own way – rather more Tchaikowsky than Sibelius in style I feel - but most enjoyable. The Lps are fairly easily obtained. Symp 1 on MFP (mono) and CFP(stereo). Symp 2 on ALP and MFP (mono). I don’t know if a stereo was ever issued or even recorded. Symp 5 was issued on CFP and is beautifully recorded although I don’t think Sargent completely understands the structure. My impression is that, since this was not in his regular repertoire, he virtually learned it specially for the recordings. They did not sell well and probably that is why the cycle was not completed. His later Lp of Tone Poems with the VPO is in a different class musically but I can’t help thinking that the VPO tended to ignore him and he dare not “correct” them.